Introduction. Tetanus, also known as lockjaw, is a very dangerous infectious, acute, usually afebrile disease characterized by muscle spasms. The causative agent of the disease is bacteria Clostridium tetani. This bacteria produces a specific neurotoxin or tetanus toxin with two components: tetanospasmin and tetanolysin. Light chains of tetanospamine cleavage synaptobrevin, which in turn prevent release of the inhibitory neurotransmitter GABA into the synaptic cleft. The α - motor neurons are, therefore, under no inhibitory control, as a result of which they undergo sustained excitatory discharge causing the characteristic motor spasms of tetanus. Materials and Methods. In this research, we attempted to normalize disorders caused by tetanus toxin by using haloperidol (at doses of 4, 5, 6, 7 and 8 mg/kg b.w. ), alone and in combination with (-)-nuciferine (at dose of 5 mg/kg b.w.) and aminooxyacetic acid (at dose of 20 mg/kg b.w.). Experiments were conducted on albino mice. Experimental tetanus was induced by application of tetanus toxin. Results and Conclusions. Application of haloperidol (alone and in combination with (-)-nuciferine and aminooxyacetic acid) was carried out 24 hours following the application of tetanus toxin. It was found that haloperidol, given alone in a dose of 4 mg/kg, prolonged the survival time of mice with experimental tetanus, about 24.35 hour compared to the control group. Thus, application of haloperidol in this dose showed to be the only effective method. Additionally, combination of haloperidol with (-)-nuciferine slightly extend survival time, while combination with aminooxyacetic acid produced the best effect on the extension of this period (about 27.74 hour compared to the control group). Atkinson W. 2012. Tetanus Epidemiology and Prevention of Vaccine-Preventable Diseases (12 ed.). Public Health Foundation, pp. 291-300. Baumert M., Maycox P.R, Navone F., De Camilli P., Jahn R. 1989. Synaptobrevin: an integral membrane protein of 18,000 daltons present in small synaptic vesicles of rat brain. The EMBO Journal, (8):379-84. Cato E.P., George W.L., Finegold S.M. 1986. Genus Clostridium praemozski 1880, 23AL. In: Sneath PHA, Mair NS, Sharpe ME, et al., eds: Bergey’s Manual of Systemic Bacteriology. Vol II. Baltimore: Williams and Wilkins, pp. 1141-200. Collee J.G., van Heyningen S. 1990. Systemic toxogenic diseases (tetanus, botulism). In: Duerden BI, Draser BS, Eds. Anaerobes and human disease. London: Edward Arnold, pp. 372-94. Coyne C.P. 2006. Comparative Diagnostic Pharmacology: Clinical and Research Appication in Livig-System Models. (1 ed.). Blackwell Publishing. pp. 263-4. Doussau F, Humeau Y, Vitiello F, Popoff MR, Poulain B. 1999. Analysis of synaptic neurotransmitter release mechanisms using bacterial toxins. Journal de la Société de Biologie, 193 (6):457-67. Farkas S., Ono H. 1995. Participation of NMDA and non-NMDA excitatory amino acid receptors in the mediation of spinal reflex potentials in rats: an in vivo study. British Journal of Pharmacology, 114: 1193-205. Hadžović S., Brankov K., Hadžović J., Muminović M. 1976. Inhibitorni transmitori u terapiji tetanusa. Veterinaria, Sarajevo 25:1-2. Halpern J.L., Neale E.A. 1995. Neurospecific binding, internalization, and retrograde axonal transport. Current Topics in Microbiology and Immunology, 195:221-41. Hardman J.G., Limbird L.E. 1996. Goodman & Gilman’s The Pharmacological Basis of Therapeutics. Ninth Edition. The McGraw-Hill Companies. New York, pp. 361-96. Lalli G., Herreros J., Osborne S.L., Monteccuco C. 1999. Functional characterisation of tetanus and botulinum neurotoxins binding domains. Journal of Cell Science, 112:2715-24. Li Y., Foran P., Fairweather N.F. 1994. A single mutation in the recombinant light chain of tetanus toxin abolishes its proteolytic activity and removes the toxicity seen after reconstitution with native heavy chain. Biochemistry, 33:7014-20. Loscher W., Honack D., Gramer M. 1989. Use of inhibitors of gamma-aminobutyric acid (GABA) transaminase for the estimation of GABA turnover in various brain regions of rats: a reevaluation of aminooxyacetic acid. Journal of Neurochemistry, 53(6):1737-50. Maddison J.E., Page S.W., Church D.B. 2008. Small animal clinical pharmacology. (2 ed.). Elsevier Limited. Montecucco C., Schiavo G. 1994. Mechanism of action of tetanus and botulinum neurotoxins. Molecular Microbiology, 13:1-8. Mujezinović I., Muminović M., Smajlović A. 2011. The effect of caroverine and its combination with aminooxyacetic acid on survival time of mice with experimental tetanus. 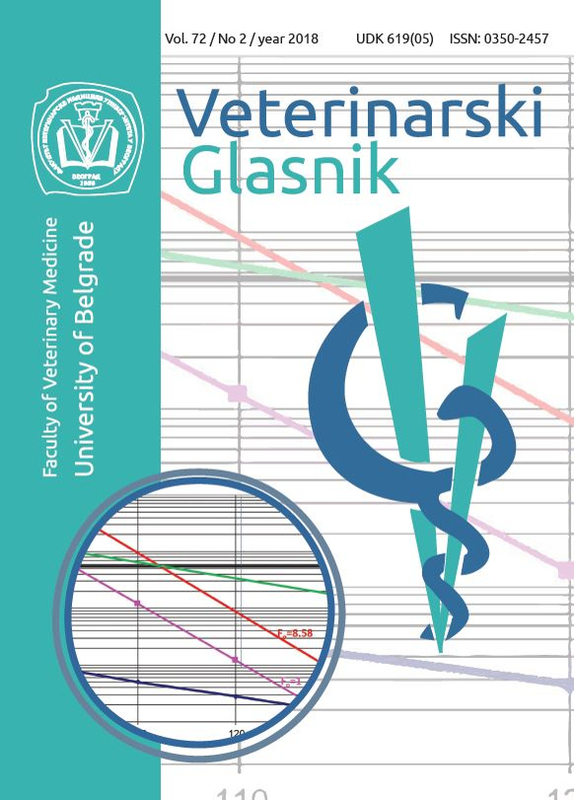 Veterinaria, 60 (1-2):1-8. Muminović M. 1983. Kombinovano funkcionalno i kompetitivno antagoniziranje djelovanja tetanus toksina kao prilog terapiji tetanusa. Magistarski rad. Sarajevo. Nakamura T., Uramura K., Nambu T., Yada T., et al. 2000. Orexin-induced hyperlocomotion and stereotypy are mediated by the dopaminergic system. Brain Research, 873:181-7. Rizwan A.M. 1999. Tetanus: A case report. Can. J. Plast. Surg. 7 (1):39-40. Schiavo G., Benfenati F., Poulain B. 1992. Tetanus and botulinum-B neurotoxins block neurotransmitter release by proteolytic cleavage of synaptobrevin. Nature, 359:832-5. Roberts P.J., Porter R.H.P. 1995. Characterization and modulation of binding glutamate receptors in: CNS Transmitters and Neuromodulators: Glutamate. T.W. Stone. (ed.) CRC Press, Boca Raton, FL. Chap. 5. Schiavo G., Matteoli M., Montecucco C. 2000. Neurotoxins affecting neuroexocytosis. Physiological Reviews, 80(2):717-66. Zamula E. 1996. Adults need tetanus shots, too. FDA Consumer Magazine.